but what really you get from such a system? What type of metadata you can get and how these are considered as useful? 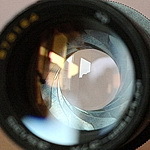 Several high end film cameras can store data such as aperture, shutter speed, ISO, ETC. I have a Minolta Maxxum 7 which stores data for up to 7 rolls of film. 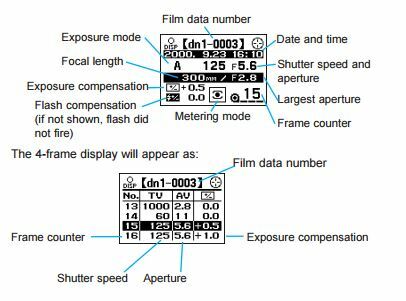 Minolta made a device, DS-100, which fits the lens mount to read and store the data to a 'smart memory' card. The data then could be downloaded to a PC into a spreadsheet. Showing the data that can be read in the camera screen. Thanks.. but how you associate that data with that specific frame in your roll? I am only familiar with the Maxxum 7 camera. The camera software assigns and prints a roll number on the first frame. The data is saved in the camera memory and can be manually read then input to a spreadsheet or metadata for scanned images. I can imagine that job would be tedious. There's exif4film app for android devices and standalone windows app for uploading data to photos' metadata. The trick will be to convert spreadhsheat delivered by Maxxum 7 camera into way exif4film windows app can read and after that it's matter of a few clicks. I've used this application a lot when I was testing camera/film/lens or if I needed to store film exif data or GPS data. Android app is very well thought over - first you make database of your cameras and lenses. Later, when you start a new roll, you select type of film, ISO and camera for whole roll and on every frame you could select lens (from database you have made before) aperture, speed, compensation, filters, description and so on. Also GPS location is being saved for each frame individually. Quite capable application and very quick and easy to use in the field. You could have a few cameras and rolls started in app at the same time. When you scan developed roll you could upload data stored in the app to the standalone windows app and after another click, every data saved within application is transfered to EXIF and IPTC of your files frame by frame. I have been thinking of getting a Maxxum DS-100 for some time. I saw a reasonably priced unit on EBAY and it is on the way. Hopefully everything will work and I can make time for a walk around to shoot a roll or two of film. I will report on the results.